Rooms from $119.00 per night. Description Travel with confidence at the new Courtyard Atlanta Lithia Springs located 15 miles west of the Hartsfield-Jackson International Airport and one exit from Six Flags Over Georgia. Our location offers easy access to the many attractions in downtown Atlanta including the new Mercedes-Benz Stadium. Designed with the modern traveler in mind our guest rooms feature sleek decor and contemporary furnishings to make you feel at home. Stay productive and connected with our complimentary Wi-Fi and ergonomic workspaces. After a restful night's sleep in our plush bedding fuel up at The Bistro our on-site restaurant serving delectable American cuisine for breakfast and dinner as well as Starbucks? beverages and evening cocktails. In your downtime visit our state-of-the-art fitness center to maintain your workout routine. Then take a refreshing swim in our outdoor lap pool. Whether traveling for work or play experience a successful stay at our new Courtyard Atlanta Lithia Springs. 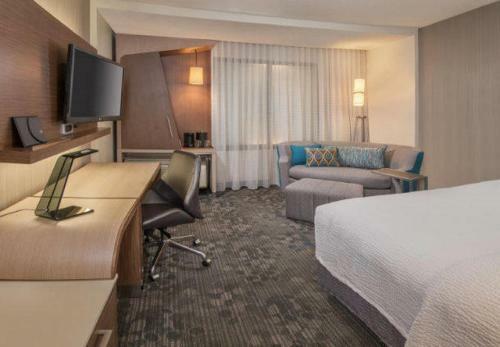 Add Courtyard By Marriott Atlanta Lithia Springs to your free online travel itinerary.